29/04/2008 Latest news: fire appears to be moving away and is under control. The pine forest habitat of the sub-species of the blue chaffinch (Fringilla teydea polatzeki), found only on Gran Canaria has been decimated by this week’s fire. Until several days ago just 250 of these birds survived on the island. 95% of these birds lived in the Pinewoods of Inagua, Ojeda y Pajonales, precisely where the blaze first broke out. In fact the first people to evacuated were the researchers studying the bird. These researchers have stressed the importance of rebuilding drinking holes. The healthier population of the blue chaffinch on Tenerife seems to be less affected. SEO and follow sub links. Image from Nasa of the fire on Tenerife and Gran Canaria. 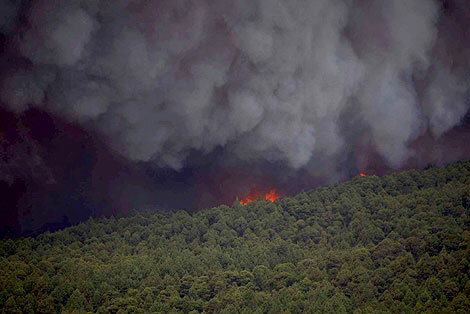 Somewhere between a third and a half of Gran Canary’s forest has been burnt.